The NNNG elected its new Chair of the group at its executive committee meeting on Sunday 8th July 2018. Claire Campbell, the current communications officer, was elected to replace Liz Anderson who stands down from her role in December 2018 after 8 years in the position. The committee announced the results of the election at the annual general meeting held on Monday 9th July 2018. In response, Claire Campbell, Chair Elect said ‘’ It is an honour to have been elected as Chair of the NNNG. Liz has been a fantastic Chair, her commitment to the NNNG has been unwavering. Her passion to ensure that the importance of nutrition and hydration in patient care is promoted and recognition of the nurses role in ensuring safe delivery of this, has led to the NNNG’s involvement in many key projects over the years. These are indeed big shoes to fill, however with her leadership and the support she has given the committee, this will empower us to continue this work and remain influential at national level’. Liz Anderson, Chair of the NNNG said ‘’I am thrilled that Claire has agreed to take this role on. It has been an honour and a privilege to serve as Chair of the NNNG and I am leaving it in good hands. Claire is an extremely knowledgeable nutrition nurse who has got a lot of experience working at national level. Her calm and considered approach is one that she will be able to use to enable the voice of nursing is continued to be heard at the national table. Her expertise in her job means that she will be able to impart and share knowledge to both members and the wider nursing family. I wish her all the best in the role’’. Liz Anderson will remain a member of the NNNG, but moves over to the executive committee of BAPEN, where she will be the Patient Experience officer. Working in partnership with patient groups and the wider health professional team to ensure that all our patients get the best experience and nutritional care. 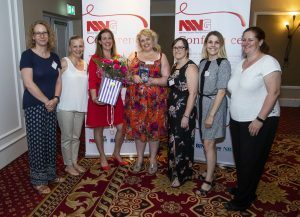 The NNNG committee and Claire Campbell – Chair Elect present Liz Anderson with flowers and gifts for her time as NNNG Chair.